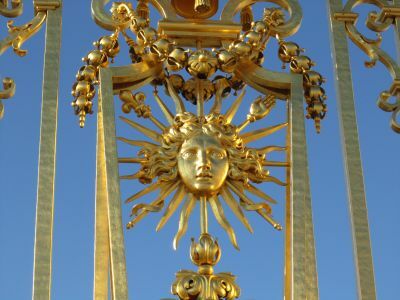 King Louis XIV of French, the Sun King, is known for its exorbitant Court and spectacular events at his palace of Versailles. He was the first of the Bourbon Kings living at Versailles Palace. 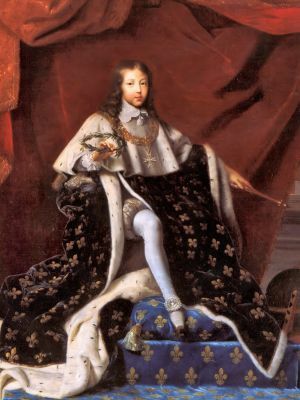 In 1643 his father, Louis XIII of France died, and the five-year old Louis XIV became king of French. His mother Anne of Austria was his regent Real power, however, was with Cardinal Mazarin, the prime minister of France at the time. The cardinal succeeded in ending the war with Spain and even arranged the marriage of Louis the 14th with Maria Theresa of Spain, the daughter of the Spanish monarch Philip IV in 1660.
on 7 June 1660 the Spanish princess Maria Theresa of Spain meets Louis XIV of France for the first time. The meeting is set on an island in the Bidasoa river, a natural border between France and Spain. She has to say goodbey to her father and most of her compagnions. Two days later, on June 9th the marriage takes place. 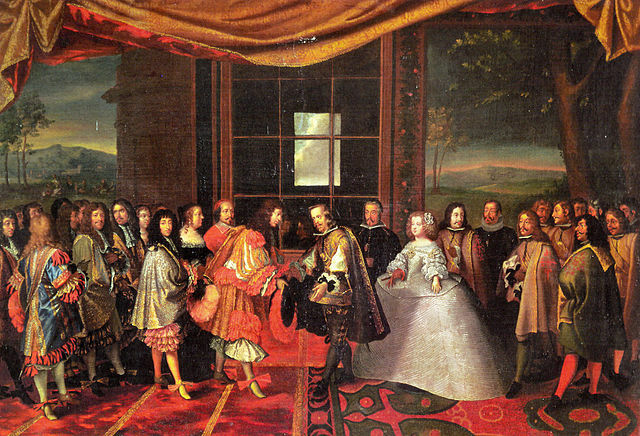 Left in red is Louis XIV, his mother Queen Anne is behind him, together with Mazarin. It is the first time Anne sees her brother King Phillip IV, who is the one on the right, since 1615, when she herself came to France. They had six children together, but only one of them, Dauphin Louis, survived childhood and outlived his mother (wonder why...). Marie Thérèse came to France at the age of 17 and died at the age of 44. She had to put up with her husband and his many mistresses and was even greatfull if these mistresses were kind to her. Especially Madame de Maintenon insisted Louis had to spend more time with his wife. She lived a boring life and claimed that she only had one happy day during her marriage. Which day this was remains a mistery. Cardinal Mazarin was also responsible for the precipitation of La Fronde (1648-1653), a revolt of the French nobility against the Royal regime. Louis the 14th was very grateful for this. This revolt was one of the reasons for the origin of the Cult of the Sun king. King Louis XIV was convinced that he was appointed by God himself, and that he thus ruled on the basis of the 'Droit Divin', the divine law. Louis wanted to avoid others having so much power that they could threaten the peace in the Kingdom again. When he made Versailles his permanent home, and as a result, the centre of political and cultural power of France, he insisted all the nobles to move there with him. He wanted the aristocracy near, so he could keep an eye on them all the time. In addition, they had to regularly participate in extensive Royal rituals, in which the superiority of Louis was underlined. So he placed himself in the centre of their world, as the sun, hence the Sun King, and the nobles were surrounding him like planets. This centre of the universe was basically his royal bedroom, which was situated in the middle of Versailles palace. The Dukes, earls and other members of aristocracy had rooms or apartments surrounding the Kings bedroom. 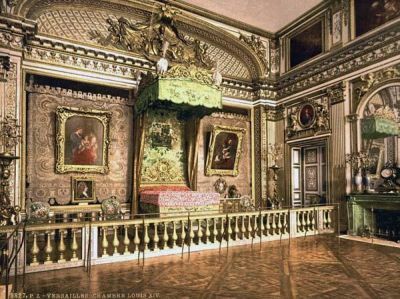 The closer your room was to the royal bedchamber, the more important you were. The greatest honour was to be present when the king woke up and went to bed. If you were allowed to assist or even just be present at these daily ceremonies you had a very good positions at court. These ceremonies, knows as the petit lever and the grand lever in the morning, and the coucher in the evening revealed anyones status at court. Only the most important people were allowed behind the balustrade that surrounded the King's bed. From now on the nobles of the la Fronde would argue who would have the honour to put on the King’s nightdress! 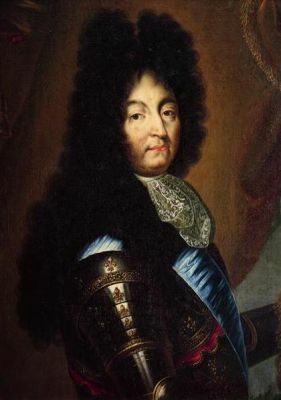 Louis XIV also had many children with multiple mistresses. He had his first 'official' affair with Louise de la Valliere. 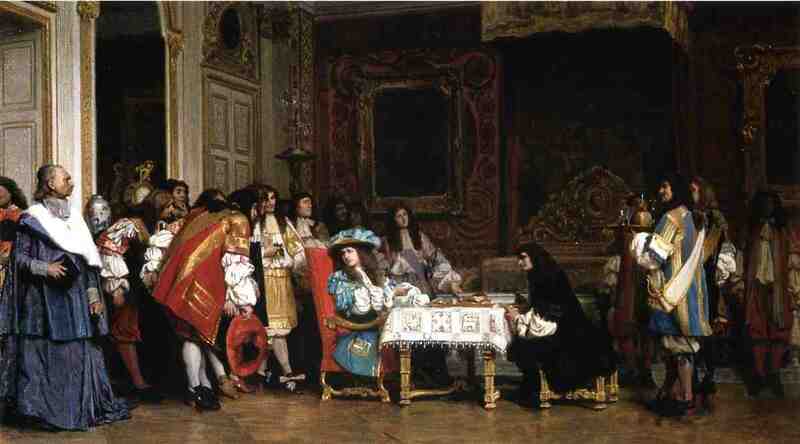 Some say the move of the court to Versailles was to avoid this affair to become public. But than again, it is hard to think that the king had to keep his mistresses a secret. In fact, having a mistress was a common practice at court in those days. More than that, the affair was encouraged. There were rumours going on of a romance between Louis the 14th and his sister-in-law Princess Henrietta Anne Stuart of England. To counter this gossip Princess Henrietta herself introduced her lady-in-waiting Louise la Valliere to the king, and they started a romance. 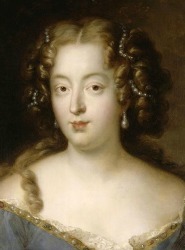 Louise XIV and Louise had four children together. Only two children survived infancy. 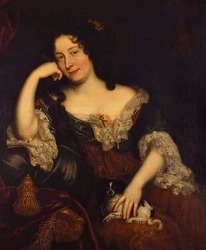 In 1667 Françoise 'Athénaïs' de Rochechouart de Mortemart replaced Louise de La Vallière as mistress of Louis XIV. 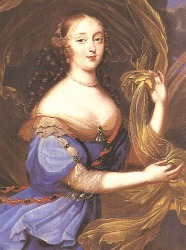 Athénaïs was married to the Marquis of Montespan, and is also known as Madame de Montespan. She was a lady-in-waiting to Queen Maria Theresia and very popular at the French court because of her beauty, charm and intelligence. Louise de la Valliere was also still at court, serving as a decoy for the new relationship with Athenais, who was married. At one time Louis the 14th just forced his wife, the Queen, her lady-in-waiting Athenais and Louise de Valiere all to travel with him in the same cariagge! Madame de Montespan and Louis XIV had seven children, only four of them reached the adult age. Six of the children were recognized officially by the King. Before the children were legitimised, they lived in a house on the outskirts of Paris with their governess Madame Scarron, the future Madame de Maintenon. She was also a companion for the Marchioness of Montespan. The king would frequently meet her when he visited his children. After the children were legitimised, they all came to live at Versailles Palace and Madame de Maintenon moved with them. There the king and the governess would meet even more. The king rewarded her generously for her services which made it possible for her to buy Chateau de Maintenon. She had the idea to withdraw there in retirement, but as she got closer to the King she abandoned this idea. After his break with Madame de Montespan in 1680 the King got a relationship with Madame de Maintenon, a very pious but intelligent woman. 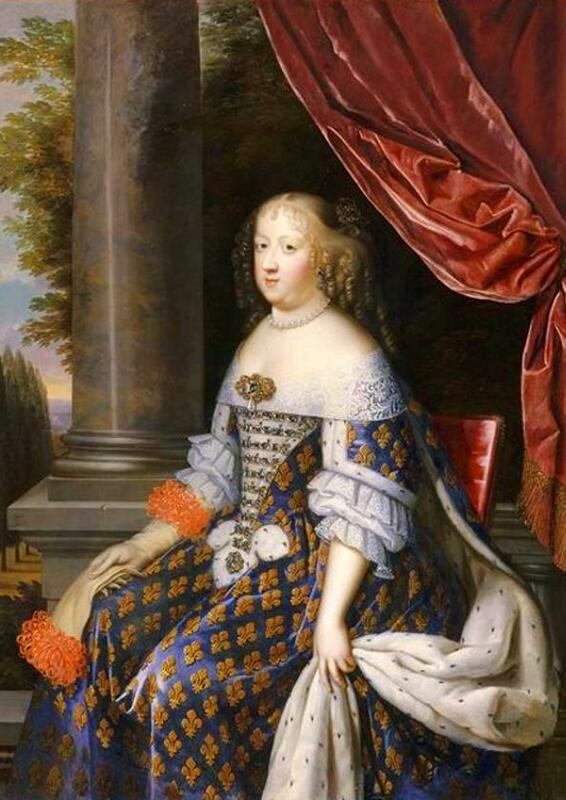 The king even married Madame de Maintenon in secret after the dead of Queen Maria Theresia. They had no children. The mistresses of the King lived in apartments close to the royal bedchamber, a secret entrance connecting the two. The other hidden staircase from his rooms lead to the apartment of his dogs, who he wanted to feed himself each morning! 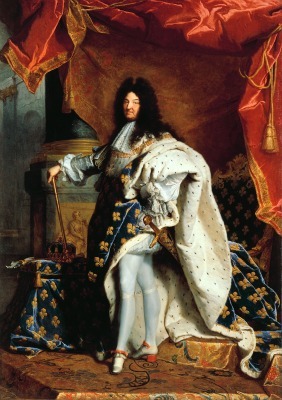 King Louis XIV got France into many wars, most of which he started. He did this first of all in defence of France and, secondly, to extend its area. All these wars and the outrageous lifestyle at Versailles Palace cost an awful lot of money and Louis XIV had little regard for the lives of the common people in France. Taxes had to be filed by those with the least money: farmers and tradespeople. The rich nobles were exempted from tax. When the King died the kingdom was completely bankrupt. His successors had a hard time reigning the country with this legacy and eventually this led to the French Revolution and the end of the reign of the bourbon kings. The Sun King, Louis XIV died on 1 September 1715, four days before his 77th birthday. He died a miserable death by gangrene, a very painful infection in which the tissue dies off and colours black. Louis XIV was eventually succeeded by his great-grandson Louis XV, at that time also five years old. The other heirs, including his son, Dauphin Louis and his grandson, Louis of Burgundy, died during the 72-year-long reign of Louis XIV. 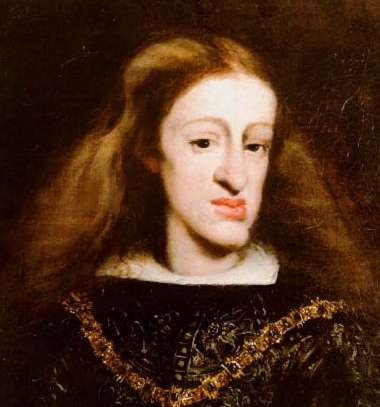 Other royals around Europe did their best to imitate the pompous lifestyle of Louis. Clones of Versailles appeared throughout Europe, like Schloss Herrenchiemsee in Bavaria. Louis XIV is burried in the basilica at Saint Denis in Paris. You will find him dowstairs, were he has a rather simple plaque marking his grave.